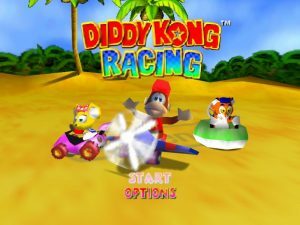 The Donkey Kong Country series had provided some of the most popular games on the SNES and Diddy Kong was a large part of that series. As a result, Diddy was a popular character of his own and so he got his very own game in the form of Diddy Kong Racing, which acted as a kind of rival to Mario Kart 64. What’s quite appealing about this game is that even though it’s just a game about cartoon characters racing, it actually has a story to it – although it is quite a weird one. An evil genie space pig comes to Earth and lands on Timber’s Island, threatening to destroy the planet unless he is defeated in a series of races – he also brainwashes several of the island’s inhabitants and turns them into his underlings (who also need to be raced.) Timber the Tiger, who lives on the island (but whose parents are away) calls on his good friend Diddy Kong to help him out with this predicament. Diddy comes (along with some friends) and together they compete in races to save the world! Although I’m very fond of stories like that, I know that for most people the plot isn’t important for a game like this. So what’s the gameplay like? Well, in the single player mode, you have a hub world to traverse and you travel to different areas to do different races. For winning these races, you are given golden balloons which you use to access more areas, races and vehicles. After winning the races, you’re then given the occasionally difficult task of winning the race again, but collecting several silver coins along the way. As for the racetracks themselves, I think they’re all pretty amazing. You’ve got a haunted forest, an old castle, a Christmassy village, the inside of a volcano, pirate caves and lots more. I feel like every track has a lot of character to it and having different tracks suited to different vehicles (cars, hovercrafts and planes) as well as allowing multiple vehicles on several of them, means that there’s always a great level of variety. There are also a few bosses (who are giant creatures) who need to be raced on their own special tracks – they can be pretty tough, but also pretty fun. Another thing worth mentioning is the selection of characters. Aside from Diddy, you’ve also got Krunch, a Kremling who makes his species playable for the first time, Banjo, who went on to start in the amazing Banjo-Kazooie series, Tiptup, a turtle who starred alongside Banjo in Banjo-Kazooie and Banjo-Tooie, Conker, whose life took a very unexpected direction and several others too. I did originally think that the characters who never really went on to do anything else (Timber, Pipsy the Mouse and Bumper the Badger) were a bit boring, but I’ve grown fond of them over the years. On an even weirder note, Tricky the Triceratops (the game’s first boss) kind of went on to appear in Star Fox Adventures. All these little character connections are very interesting to me and are probably going to be appealing to other fans of Rare too. One thing that might disappoint some people, is that this game doesn’t really carry over the atmospheric tone that the Donkey Kong games had become known for during the SNES era. There’s the odd moment, but generally it feels quite disconnected to Diddy Kong’s earlier (and later) appearances. It actually feels a lot more like a Banjo-Kazooie prequel, really, in terms of tone. I’m happy with that, but others may not be. But, really, I’d hate to leave a negative impression, as this is a fun and enjoyable game. There’s a superb soundtrack (and I re-listen to the music from the snowy tracks every December), solid gameplay and you can have lots of fun playing with friends too. It’s a terrible shame that legal difficulties make it hard for this game to be made available digitally. But if you do have an opportunity to play it, you definitely should.